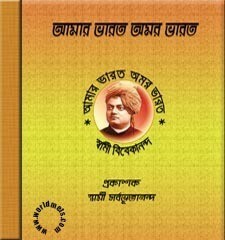 ‘Amar Bharat Amor Bharat’ written by Swami Vivekananda. Amar Bharat Amor Bharat written by Swami Vivekananda. Amar Bharat Amor Bharat was written by Swami Vivekananda. Swami Vivekananda, one of the prominent leaders of the 19th century, was born in an unprecedented wave of Renaissance in India. Many scholars call Swami Vivekananda as the creator of modern India. Indeed, Swamiji has been greatly influenced by every aspect of India’s renaissance. Chakravarti Rajagopalachari wrote: If we look back to our modern history, anyone will see clearly how much we are to Swami Vivekananda! India’s self-esteem was not included in India but he made the spiritual foundation of politics. We were blind, he gave us the vision. He is the father of India’s independence, our father of political, cultural and spiritual freedom. During the Mughal period, the ancestors of Swamiji were living in the village of Derona, in the Kalna subdivision of Burdwan district. At the very beginning of the British period, Ramnidhi blood of the family came to Govindpur in Calcutta. After occupying the land for making East India company fort, Dutta family came to Shimulia or Simla in north Kolkata. Later, the family of Rammohun Dutta built the house for himself in No. 3 Gourmohan MukherjeeStreet. Durgaprasad left his family twenty years and became a monk. Durga Prasad’s son passed the attorney examination in 1866 and was appointed to that job. Vishwanath was married to Bhumeshwarri Devi, the only daughter of Simla’s Nandalal Basu. Their sixth child Narendranath Later Narendranath is Swami Vivekananda. Vishwanath Dutta was proficient in seven languages. History and music were his favorite subjects. He was a fan of Hindu Muslim mixed culture in food, clothing, etiquette and in the workplace, the English followed. In that era, his monthly income was abundant, he used to live in a royal house and would care for many relatives and poor people. His attitude towards children’s education and other matters was not to be busy with a liberal future. He did not think about what would happen to boys and girls in his absence. He used to say that if they give proper education to children, they can stand their own life. Under this attitude, he encouraged the children in independent thinking, without mentioning any particular religion, he used to teach the essence of various religions and encourage them in sports and exercise. Country tour was one of his addicts. The wife Bhubaneswarwari Debi was very proud of her attitude towards women. Her heroes were poor and poor. The poor never got empty hands from her. All the things in the world. It was her daily work to learn the regular work of reading the holy scriptures and to share the happiness of neighbors. Narendranath started learning English first to her. Narendranath was born before sunrise on 12th January 1863, on the day of Paush Sankranti. Afterwards Narendra Nath passed the Entrance examination and became a member of society and society. And the traveler started to spend life. Went to different parts of India. And many scholars meet professors and try to learn about their opinions and country. Finally, he arrived in Chicago on 30 July 1896, where he went to other places and came in contact with various professors and scholars. Among them, Harvard University professor Wright specially requested Swamiji to join the forthcoming religious meeting and wrote to the chairman of the committee, Dr. Byaron in a letter: If all of us join together, more scholars will be more than what they will be. Beginning on September 11, he gave six lectures and four lectures in the adjoining science section. Overnight, he became famous and became the most popular speaker, publicizing Chicago’s public on the street for his generous and logical argumentative views. “Even though he is very impressive and his religion is a good religion, he can achieve many of his teachings, just like the sky,” – was published in the Wisconsin State Journal (21.11.1893). He has been invited to speak from various places in America and most of the places are entertained by somebody’s house. In late 1893, after giving a speech in various cities of the East and Central West, he went to Detroit in February 1894. After the lecture there he returned to New York and from 18 June 1895 he stayed with the twelve disciples in the island park. To teach the religion in the hands and go to her husband for her rest. After that, Europe returned to New York from London on December 6, from August 24 to September 9 in Paris and December to November 27. With lectures in various places on April 15, 1896, he went to Europe again, for almost three months, France Switzerland, Italy, Germany, Holland, Vedanta, started preaching. Returning to India on 3 months to 6 December in London. ‘Swami Vivekananda BharatChetana O Pashchatya’ written by Sushil Kumar Rudra and so many author’s was written about him and till today also.. This book has a lot to know about Swamiji, so reading this book can be possible to gain knowledge about Swamiji. In this book, “Amar Bharat Amor Bharat “, Swami Bireshwarananda said in an illustration: “A young man alone has brought work among the tribes. At that time there was no one with him. Many people, non-governmental people have come behind him, the work has gone a long way – The size has come in fact the void of selfishness I am selfish I am alone when I realize the weak people, this person is true then. So Readers can get this book ‘Amar Bharat Amor Bharat’ as pdf from this page. Amar Bharat Amor Bharat by Swami Vivekananda. Lot of thanks for responding us and your valuable comment, if you need any more please fill free contact us.